cartoon.. - A mummy's inane blabberings.. This coloring page was found in Star Wars: Droids' and 'Star Wars: Balance of the Force' coloring books by Dalmatian Press. Heh..I don't know whether to laugh or to cry at the rather awkward positioning of Leia and Darth Vader which makes it quite (unintentional I hope) sexual..
Says Andrew Towkin, "I hope this unfortunately suggestive angle was unintentional, especially considering the father-daughter aspect of the scene. Yecch. Vincent Gallo's The Brown Bunny billboard on the Sunset Strip created public outcry, and yet impressionable youth everywhere are dulling their Crayolas on this very scene. Strange." Shooo Cute!This more accurately showcases the incredible talent of JackJack!! He can levitate, go thru solid surfaces, shapeshift, becomes a human torch and shoot laser from his eyes! No wonder the babysitter freaked out. We didn't see this in the moviei eh! spongeman took a screen capture of this from The Incredibles DVD. 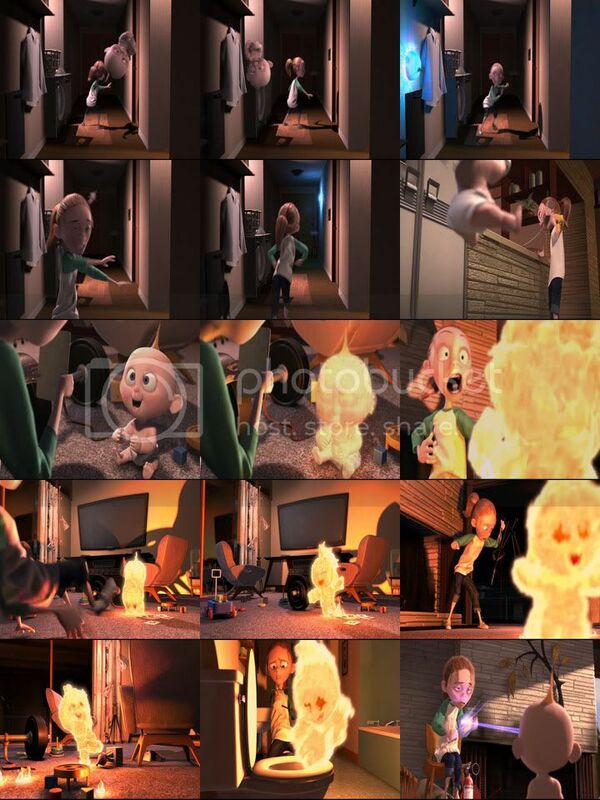 Man, they should have kept this segment in the movie..
And I like the true talents of Jack Jack. Didn't like the portrayal of his powers as demon-like. This is more like Advanced Firestarter :O) Cool. PS: Do you watch anime? never doubt the 'talents' of the dark lord hehehe..! Yeah I do tho not as much as I love to watch the US dramas/reality shows + TVB dramas! I'm hooked on some of the korean dramas too. Man..too many tv shows..not enuff time! Not a true fan, no but I do watch it (don't dl it though). Share, share! For your own personal entertainment or an early birds&bees lesson for Aidan? think i better go buy the Incredibles DVD tomorrow..heard there are even more gems innit! ahhh..... now we all have to browse through that copy of star wars colouring book at that bookstore we happen to pass by everyday. just to check if its in that book. oh ..so it is sellin at our bookstores? wah buy buy! Princess Leia giving in to the Dark Side... That must have been quite a blow to Hans. Oh and now we know why Leia has those two buns on her head. HEH. waliao..i gotta go buy that dvd then! There's Princess Leia, thinking: "When Yoda said I should give a great blow to the Dark Side, this is NOT what I had in mind..."
hiaks..you guys are so pun-ny! I saw those shots too and was wondering how come I didn't see that in the movie! We have the Mr. Incredible DVD. My two kids (4 1/2 & 2 1/2) enjoy watching it over and over again. We all love the "Jack Jack Attack" section, but it is too short. I hope they will come up with Incredible II to talk more about Jack Jack. Yeah..i think everyone's fave was Jackjack! I must go get the DVD to watch this clips of Jackjack..!